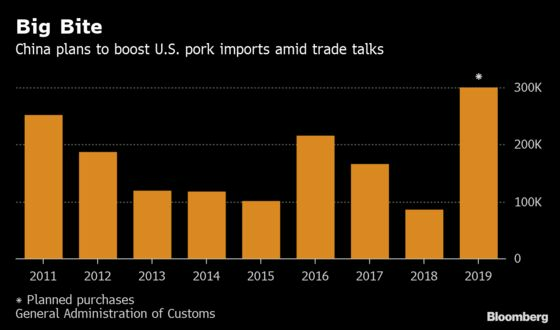 (Bloomberg) -- China may increase U.S. pork imports to a record this year as part of a commitment to bolster purchases of American farm goods to resolve the trade war, according to people familiar with the situation. Imports may rise as high as 300,000 metric tons of pork in 2019, the people said. That amount would be 81 percent more than the 166,000 tons in 2017, before the trade dispute started. One of the people said the Asian nation may order 200,000 tons in the first half of the year alone. 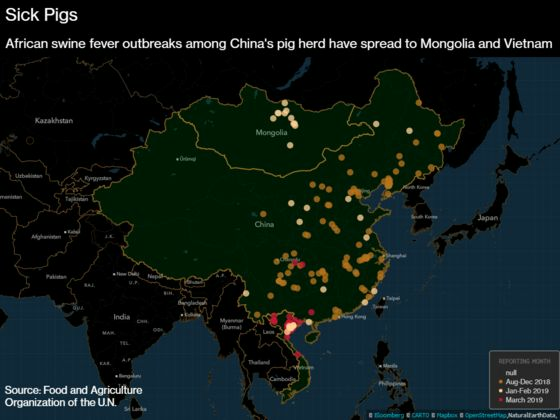 The final volume will depend on the outbreak of African swine fever in China, according to one of the people. The disease, which is fatal to pigs and is proving hard to contain, devastated hog production since it was first reported in August. It’s already slashed the sow-breeding herd in the world’s No. 1 pork market by 15 percent. “All protein imports may rise,” said Pan Chenjun, an analyst at Rabobank International in Hong Kong. Increased U.S. pork imports alone “cannot offset the pork shortage in the country." The cullings have pushed up prices in China and led to the nation making its third-biggest weekly purchase of pork from the U.S. ever as the trade war boosted tariff levels to 62 percent. The U.S. Department of Agriculture expects total Chinese pork imports to jump 28 percent this year with Brazil the biggest beneficiary. Nobody replied to a fax sent to China’s Ministry of Commerce. China’s pork production could drop by more than 25 percent from last year’s 54 million tons, Rabobank’s Chenjun said. Imports from the U.S., the only country that can meet China’s growing demand for hogs, could rise to more than 300,000 tons once the tariffs are removed, she said. Hog futures for June settlement on the Chicago Mercantile Exchange closed 0.2 percent lower at 95.325 cents a pound after rising as much as 0.7 percent to 96.225 cents. On March 22, the price reached 97.825 cents, the highest ever for the contract that debuted in December 2017. The estimate for China’s imports may be “quite conservative,” given the losses from the swine flu outbreak and the Asian nation’s appetite for pork, Rich Nelson, chief strategist at Allendale Inc. in McHenry, Illinois, said in a telephone interview. “My estimates, and some of the others I’ve seen, are actually calling for a tripling, if not even quadrupling,” he said. Hog futures have surged 26 percent this month. Aggregate trading on the CME rose to a record on March 13.